Its a concept car... it has gullwing doors... of course I have one in my collection. 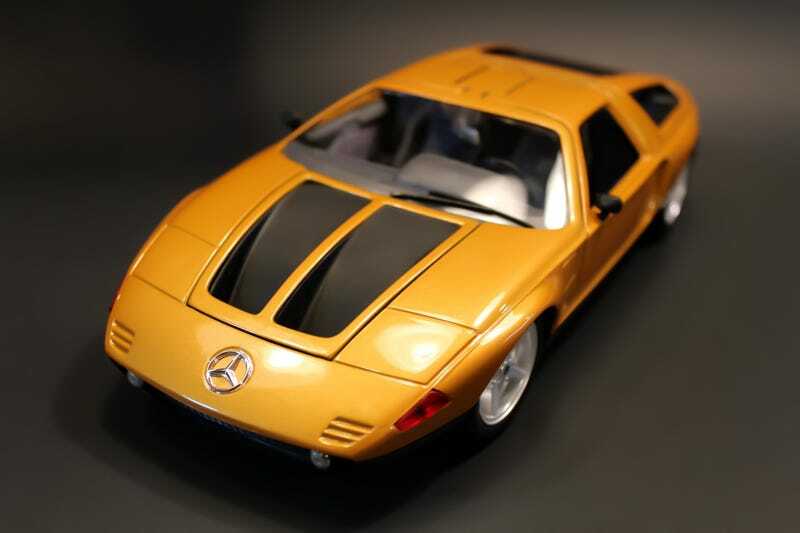 This is the Mercedes Benz C-111 by Guiloy. This is my second Guiloy and honestly, I just picked it up off ebay a few weeks ago. I had been tracking these, and one finally popped up for sale. The auction started at $15 and had no reserve. I watched it until the end and sniped it away at $64, plus another $14 for shipping. Most of these have started at or above $85, so I felt like I got a good deal. There were actually four versions of the C-111, all of which were nothing more than prototypes for testing engines and materials. Starting in the interior,the door cards are incredibly detailed. This is largely due to the fact that they are stickers! Somewhat disappointing, but also welcomed over plain plastic doors. The interior is both simple and detailed at the same time, and you’ll find even more stickers on the dash. The Mercedes tri-star logo has slid off the steering wheel center most likely due to age. Still, the dash and console stickers are some of the best I’ve seen. The fire extingusher is a nice touch. You don't know what could happen with these experimental prototypes. In the back, we find a mid-mounted rotary engine! The initial C-111 had a three rotor, and the second concept had a four rotor. The last two prototypes switched to diesel power plants. It’s too bad that luggage tray isn’t removable because this is the best look you’ll get. The hood prop is handy too so the engine can be displayed. Under the hatch up front, there’s some fluid reservoirs, more luggage space, and visible cooling fans. The hatch is sturdy enough to stay propped open on its own, too. Guiloy made a valiant effort to include brake detail, although the textured rotors look more like they’ve been scored and need replacement. The last feature we haven’t talked about yet are those amazing Gullwing doors. They’re heavy and stay locked into place for display.